Barnes Gap car park is located at the junction of Landahussy Road and Mullaghbane Roads. These roads are accessible from the B47 Glenelly Road that links Plumbridge, Cranagh and Sperrin. 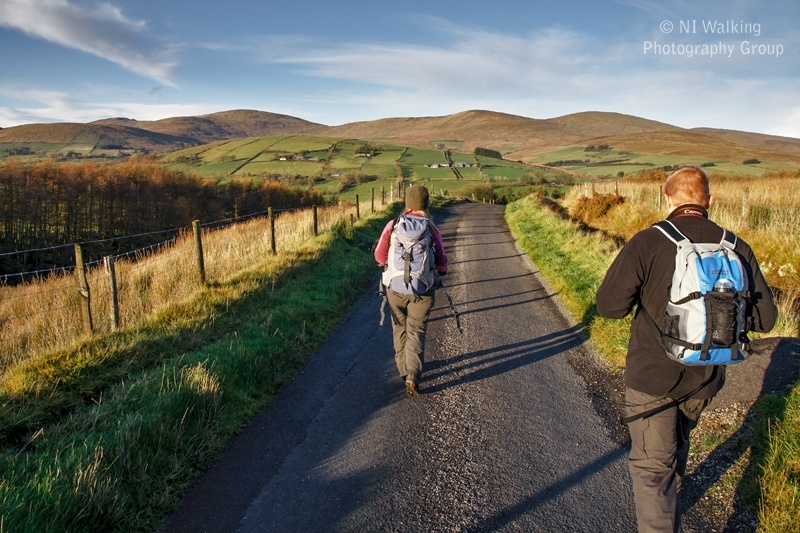 This 7 mile walk provides a taster of what the Sperrins have to offer, rolling hills, lush green valleys and a snapshot of rural life. Start from Barnes Gap car park in Glenelly Valley clearly marked from Gortin and the B47. The car Park was once the site of The Barnes National School. Toilets available. This route is fully marked with way marked posts and directional arrows. It follows the same line as the Craignamaddy Route for some time but leaves it just after Scotch Town cross roads.The route follows The Craignamaddy Route and The Ulster Way at a small stand of coniferous trees at Garvagh. From the car park follow the finger post sign for the Craignamaddy Circuit across the road proceeding uphill to the top of the gap. Just over the brow of the hill a left turn leads to a gravel lane that contours Mullaghbolig. Continue on this track and descend into the Owenkillew Valley past Vinegar Hill on your right hand side. Pass through a farmyard onto a tarred road. Turn right and continue straight through Scotch Town cross roads until the next turn right. The Craignamaddy route turns right up this lane but Vinegar Hill route continues on straight. At the next cross roads follow two way marked posts and continue up hill through farm buildings on each side of the road. At the next junction continue straight on to Garvagh and a small stand of coniferous trees. Turn right and rejoin the Craignamaddy and Ulster Way routes along a gravel lane. This lane continues on to meet a tarred road, turn left and you are back at Barnes Gap. You can take the high road or the low road back to the car park. The route jointly facilitated by Omagh and Strabane District Councils. For further information contact Omagh TIC Tel – 028 8224 7831 or Strabane TIC Tel – 028 7138 4444.